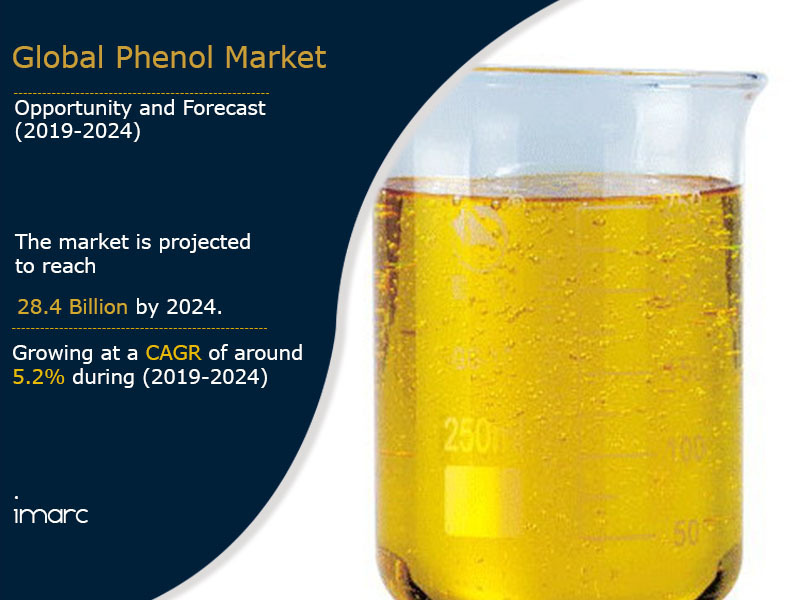 The global phenol market was worth US$ 20 Billion in 2018, registering a CAGR of 3.4% during 2011-2018. The market value is further anticipated to cross US$ 28 Billion by 2024, growing at a CAGR of 5.2% over the forecast period (2019-2024). Phenol is an aromatic organic compound with the chemical formula C6H5OH. It is a toxic, colorless crystalline solid which is commonly used as a disinfectant and antiseptic. As compared to other hydrocarbons with a similar molecular weight, it is more soluble in water due to its stronger hydrogen bonding. It is majorly used for manufacturing household products like detergents; as an intermediate or precursor for synthesizing several chemical compounds; and as a derivative in the production of nylon, herbicides, epoxies and cosmetics. Phenol finds applications as an industrial cleaner for machinery parts and electronic devices; as a starting material for plastics and explosives such as picric acid; as a raw material in the manufacturing of drugs and antioxidants; as a basic material in wood preservatives such as creosote; for making intense colored dyes; and in everyday products such as mouthwash, liquid detergents, inks, floor cleaners and disinfectants. Rapid economic development around the world has majorly contributed to construction activities in the residential and commercial domains. Since phenolic resins are used in the production of plywood, laminated beams and flooring panels, this has boosted the market growth. Phenolic resins find applications in the manufacturing of thermosetting plastics which are further utilized in the production of electrical components such as electron tubes, insulators and sockets. Apart from this, paper phenolics are employed for manufacturing household laminates and paper composite panels; and glass phenolics are used in the high-speed bearing market. Over the past decade, improvements have been made in phenol production technology. New catalysts and processes have been commercialized for manufacturing cumene via alkylation of benzene with propylene. Recent process design innovations have further been used for the cumene hydroperoxide route that remains the preferred method for its manufacturing. 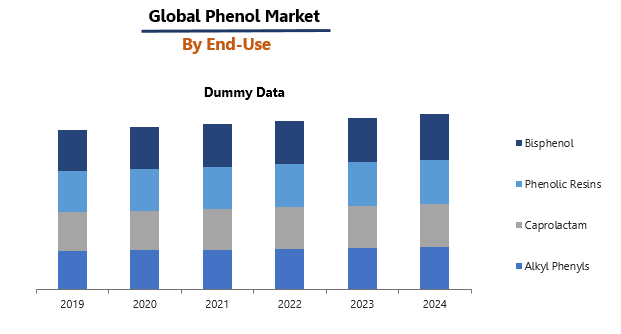 These efforts have been directed at enhancing yield and improving process costs and safety for the preparation of phenol in order to meet the growing global demand. Bisphenol A (BPA) currently represents the largest segment, accounting for the majority of the total market share. BPA finds vast applications in the production of epoxy resins and polycarbonate which are further used for manufacturing food and beverage containers, medical devices, electronic equipment, household appliances and automotive parts. On a geographical front, Asia Pacific enjoys the leading position in the market on account of the increasing production and consumption of phenol in China. Besides this, a rise in the purchasing power of the consumers has escalated investments in the chemical, automotive and construction industries, thereby fueling the market growth.